He’s got a bronze badge to say he’s one of the good guys. | The mind is an unexplored country. 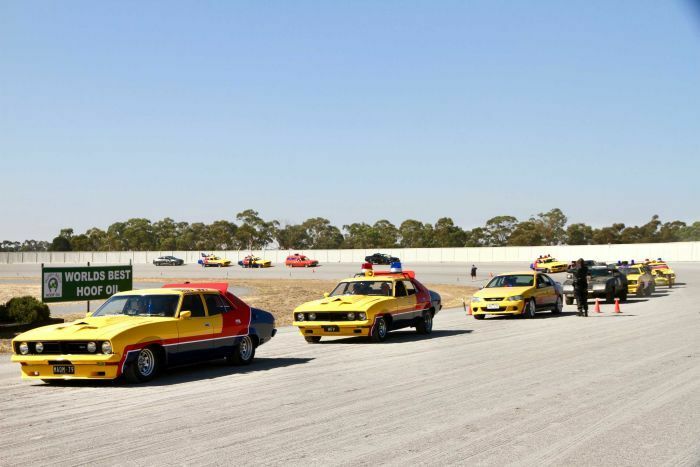 Revheads, film fans, and people who just plain like to dress up gathered in Central Victoria to celebrate forty years since Max Rockatansky lost everything in the roar of an engine. Mad Max is forty years old? Okay, that means I’m…. hmmm. Never mind. Mad Max was an international sensation. But its greatest impact was on the home audiences. Australian film, after several decades of near-death, came alive again in the 1960s and early 70s. Mostly we got period dramas – Picnic At Hanging Rock, The Getting Of Wisdom. Ladies in ankle length dresses who spoke with faux English accents. Mad Max dragged us into the future. A damn scary future, too. A time and place that called for an exceptional man… and an exceptional vehicle. Mad Max set the scene for Mad Max 2… and if George Miller had left it there, I would have been happy. Thunderdome and Fury Road didn’t carry the same punch. Thunderdome tried to be funny… it failed. Tom Hardy tried to be Max… likewise. But we still have Mad Max the original – raw, bleak, and unforgiving. « But God DID intervene, pastor Alec!